Inspiring, equipping, and mobilizing individuals and communities to take care of the place they love to live. She shares Asheville Greenworks’ amazing initiatives like river and roadside cleanups as well as county-wide recycling events. Christine is proud of their urban forestry program: they planted 706 trees in Buncombe county alone! Christine demonstrates the “Tree Kit” she designed to teach young kids about trees, nature, and the environment. The Tree Kit uses interactive games and storytelling activities to get kids interested in the environment and also educate them. Christine believes it is important to start early in educating the future generation about the environment. She loves being an environmental educator and getting to be the “cool teacher” who teaches kids about the environment, but it’s also all fun and games! We thank Christine for joining us at Forest Fridays and sharing her story with us! Follow us on Facebook to see more Forest Friday videos! Mandar Patil, Advancement Intern at Dogwood Alliance, has come all the way from Mumbai, India (the city that never sleeps) for his graduate studies at Duke University. He wants to work at the intersection of technology, business, and people to create a positive impact in society. 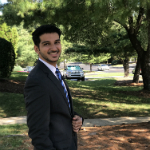 Mandar is pursuing his Master’s degree in Engineering Management and has a Bachelor’s degree in Electrical Engineering. He loves reading, meeting new people, sharing interesting conversations, and playing with puppies at The Puppy Kindergarten at Duke. Kimala is excited to be Dogwood Alliance's very first Advancement Outreach & Recruitment Manager. Having come from a small, intentional community in Tennessee, she was raised with the notion that helping to protect our world's natural resources is our responsibility and privilege. Kimala has a BA in Culture and Media from The New School.